Unusual placement of the stove, but I guess with the double doors in the back instead of top hinged one there's no real advantage to havign it in the rear. The paneling is a nice touch. Anything is possible. It's a Berlingo! In my Multispace(also a 1999) I have around 1m80 from the inside of the tailgate to the back of the front seats if the rear seats are removed(easy, only 4 Torx screws). Fold the front seats forward, and you get 2meters. That's enough for a bench/bed setup. The kitchen part can be done any way you want, really. Or skipped altogether. Start your own thread, post pictures of your car, and maybe sketch on them to show what you want, and we'll throw ideas and suggestions at you. Have you got a wind break for the stove ? 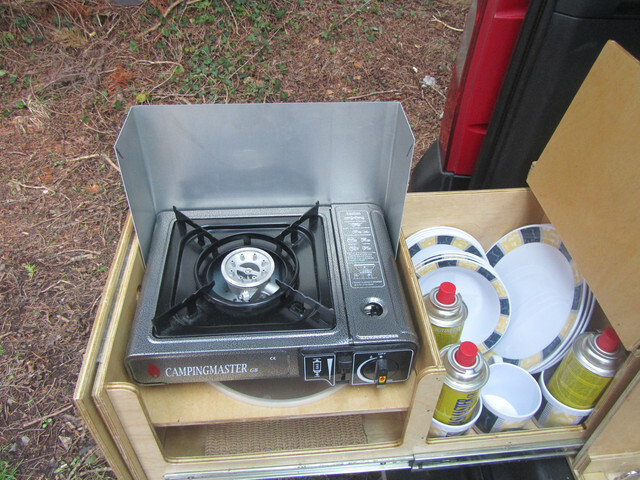 I have made a box camper that fits in the boot of my 2005 Multi and found the stove works better when the wind can't get to the flame.. I have the same stove.. These stoves can heat a pan of water in less than a minute, don't have to wait long for a cup of tea.. This acts as a windbreak for the burner, it folds over the burner when I close the drawer to keep any residual heat off my woodwork, and I can also use it on my table inside my B9 to stand the burner on if I need to cook inside during bad weather.